Three years ago, Rigby's Hunter Rackham rode into Hailey Rodeo Park at the tender age of 13 and trotted away with the title of Miss Days of the Old West Teen Queen. The Jefferson County cowgirl earned the honor of overall high-point winner. At the time, she was a cheerful proponent of all things rodeo, proclaiming to the crowd, "The time has come, so sit back, get comfy and enjoy the best show in the West!" That comment still holds true of the Days of the Old West rodeo and its Miss Days of the Old West royalty that gallop into the valley on Monday, July 2 and stay here until the Independence Day holiday has run its patriotic and festive course. And Rackham has made further waves, now serving as the reigning Miss Teen Rodeo Idaho after winning the prestigious title at last July's 96th annual Snake River Stampede in Nampa. Rackham will be back riding and helping and providing leadership next week for the 2012 Miss Days of the Old West contest sponsored by the Sawtooth Rangers Riding Club. It returns to Hailey Rodeo Park July 2-4 where the 65th annual Days of the Old West rodeo will entertain thousands. Joining Rackham at the top of the Hailey royalty ticket will be reigning Miss Rodeo Idaho Caitlin Thornton, a Twin Falls native and former Jerome County Rodeo queen who also won her title during last July's Snake River Stampede. But the main focus will be on this year's contestants. Ten girls and young women will be riding their horses and showing their skills in this year's queen contest. The numbers of contestants: One for Senior Queen, three Teen Queen four Junior Queen and two for PeeWee Queen. ( Monday, July 2: Poise and personality competition plus the interviews at 10 a.m. at Hailey Grange Hall. This year's speech topic is: "If I could be animal, what animal would I be?" Contestants will wear prairie skirts or Western dress, with their hats, boots and belts. They'll answer impromptu questions and be interviewed individually. At 4 p.m., Julie Jordan will interview the Miss Days of the Old West royalty and contestants on KECH radio. Freestyle horsemanship will be performed as pre-rodeo entertainment at 6:30 p.m. prior to "Family Night," which is the first of three rodeo performances. Royalty will help with cattle in the arena, mingle with the public and sign autographs. ( Tuesday, July 3: Horsemanship competition at 10 a.m. at Hailey Rodeo Park. Freestyle horsemanship for Senior Queen and Teen Queen contestants will be performed as pre-rodeo entertainment at 6:30 p.m. prior to the second rodeo show. ( Wednesday, July 4: The royalty candidates will also wear their show apparel for the Mile Long Parade starting at 12 noon along Hailey's Main Street. They will have their coronation at 6:30 p.m. as part of the pre-rodeo entertainment. ( Katey Martha Gutman, 17, of Salmon is the daughter of Loryhl and Jerry Davis, and Rick Gutman. She was the 2010 Miss Days of the Old West Teen Queen. In 2011 she also won Poise and Personality, Photogenics and Speech. Katey will attend BYU-Idaho in Rexburg this fall to study music education. She loves everything about music and anything to do with horses, rodeo and the western way of life. Katey also loves to hunt, fish and hang out with her family. She is involved in FFA, 4-H, high school rodeo, show choir and high school band. Katey thanked the Sawtooth Rangers Riding Club for "making this whole thing possible." She added, "I feel so honored to have represented you!" ( Gabrielle McMurphy, 14, is the daughter of Kenny and Julie McMurphy of Idaho Falls. A National Junior Honors Society member, she will be a freshman at Hillcrest High School. Last year, she was the Miss Days of the Old West overall high point winner and received a saddle from the Sawtooth Rangers. She won Poise and Personality and Speech. Last year Gabby won another high-point saddle for Warbonnet Roundup and became its princess-queen. Rodeo is a huge part of her life. She enjoyed playing soccer and running track for Sand Creek Middle School, where she was the school's top long jumper and among the fastest 100-meter sprinters. Gabby likes singing and playing guitar for her church's children's ministry. She has participated in 4-H and competed in horse judging. "This last year was a blast," she said about her reign. ( Zoie Pierce, 13, is the daughter of Jim and Karen Pierce of Jerome. She participated in the Miss Days of the Old West Junior Queen contest for the last four years including a first runner-up finish in 2008. She was a horsemanship winner in 2011. On horses since age three, Zoie has participated in horse shows, rodeos, queening and gone on trail rides. Her greatest companion through all these adventures has been her horse Skoshie. They have won multiple buckles and awards together. She also participates in club volleyball and has traveled to many tournaments throughout southern Idaho. ( Micah McMurphy, 7, is the daughter of Kenny and Julie McMurphy of Idaho Falls. Besides her PeeWee title, she carried home many prizes from last year's Hailey rodeo including Poise and Personality, Photogenics, Speech and Horsemanship. She loved being part of the rodeo, carrying the flags and riding her horse "Apple-Pie" in the big arena in front of many fans. Youngest of four children, Micah is tall for her age and quite a cowgirl. She will enter the third grade at Woodland Hills Elementary School. Besides horses, she enjoys music and even wrote and recorded her first song, to be used in Vacation Bible School this summer. Micah has taken violin lessons and likes the piano. She has a black cat named "Hola." ( Elizabeth Lockyer, 21, is the daughter of Richard and Silvia Lockyer from McCammon. Youngest of three children, Elizabeth is a third-year University of Idaho student in Moscow majoring in Pre-Veterinary Science. She is president and recruitment chair of Gamma Alpha Omega Society, Eta Chapter. She enjoys sketching, creative writing, archery, horseback riding, reading, riding her Harley and hanging with friends. ( Mickenlie Nadine Baxter, 18, is the daughter of LeRoy and Vicki Baxter of Hansen. She graduated third in her class at Hansen High School, where she enjoyed being a member of the volleyball, basketball and cheerleading varsity teams. She was Student Body president. During her senior year Mickenlie earned the Idaho Dairymen's Distinguished Student award. 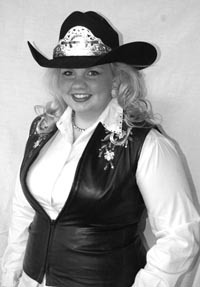 She rodeoed in District 6 of the Idaho High School Rodeo Association (IHSRA) and was the district queen in 2010-11. Mickenlie has been active in FFA, 4-H, Natural Helpers and Esteem Team. This fall, she plans to attend University of Montana Western and will focus on earning her Veterinary degree with a major in equine. ( Kaylaa Gutman, 15, of Salmon is the daughter of Loryhl and Jerry Davis, and Rick Gutman. In the coming school year she will be a sophomore at Salmon High School. Kaylaa loves to learn new things and do well in school, and she maintains a 4.0 grade point average. She is actively involved in basketball, FFA, high school rodeo and 4-H. During the recently-completed rodeo season, she qualified for state in three of her five events and won Reserve Rookie All-Around. A believer in the strong character and work ethic that rodeo provides, Kaylaa loves the sport and enjoys promoting the western way of life. In 2008, she was Miss Lil Bit Rodeo Idaho. In 2010 she won first runner-up of the Miss Days of the Old West Junior Queen contest and last year she was second runner-up in Hailey Teen Queen. Kaylaa was freestyle horsemanship winner and took the Photogenics prize at Hailey in 2011. ( Ellie Mae Millenkamp, 14, is the daughter of Bill and Susie Millenkamp. Born and raised in Jerome along with two brothers and one sister, Ellie attends Lighthouse Christian Academy in Twin Falls where she plays basketball and volleyball. Since the age of seven, she has been involved in 4-H and as a member of the Idaho State Horse Show Association showing both Western and English. She wasn't raised in the rodeo arena, but Ellie Mae fell in love with the sport when she attended her first rodeo in Jerome. As an 11-year-old in 2009, Ellie Mae won the Miss Days of the Old West Junior Queen title and added freestyle horsemanship honors and the Junior Queen horsemanship prize. Her motto is "Dreams don't work unless you do." ( Emma Elaine Flolo, 11, is the daughter of Jack and Julie Flolo of Hailey. She is a seventh-grade honor roll student at Wood River Middle School in Hailey. As a member of the Hailey Wild Riders 4-H Club, she participated in the Blaine County Fair and won multiple ribbons. Last year Emma, along with her horse Schmoo, was first runner-up for Miss Days of the Old West Junior Queen. In her class she won Poise and Personality, Photogenics and Speech prizes. She loves being part of her school choir and volleyball club. Emma also enjoys playing Storm basketball. ( Conner Ann Clark, 12, is the daughter of Larry and Noelle Clark of Hailey. She has always nurtured a love and soft heart for animals, especially horses. This is her fourth year riding with a 4-H group that has become a second family. Conner has gotten off to a good start competing for the first year with the Idaho State Horse Show Association. She is completely dedicated to what has become her passion. She thanks the Sawtooth Rangers committee for putting on an awesome rodeo. ( Kloie Pierce, 13, is the daughter of Jim and Karen Pierce of Jerome. She enjoys playing club volleyball, participating in 4-H and, most of all, competing in rodeos and queening. When she does this, she rides her faithful horse of 10 years, Oshie. The big paint has packed her through many trails, won her many awards and has become her best friend and companion. Kloie thanked contest organizer Michelle Bobbitt for her help and encouragement, and for staging a top-notch competition. ( Hailey Kelso, 14, is the daughter of Mike and Stacey Kelso of Idaho Falls. She will be a freshman at Shelley High School. Hailey is the reigning Miss Eastern Idaho Outstanding Teen. Her platform was, "Tickle Me Pink, Breast Cancer Awareness." She has been active in promoting breast cancer awareness and early detection in large part because her mother is a survivor and a friend passed away last summer from cancer. Hailey has been active in community service projects like building bunk beds for the Women's Homeless Shelter, making blankets for the pre-natal unit of her local hospital, and supporting Relay for Life. She is nvolved in the Idaho Falls Figure Skating Club. She is a performer in the Elite Talent Agency that stages singing works at community venues. Hailey loves to entertain and plays the piano and guitar. Her goals include becoming a country western singer, a photographer and/or a nurse at Primary Children's Hospital. She is active in horse 4-H and other 4-H projects, horse shows and barrel racing. ( Bailey Cole, 9, is a Hailey resident who will be a fourth grader at Hailey Elementary. She is the daughter of Erin Cutler Cole of Hailey and Robert Cole of Boise. This is Bailey's third time in the Miss Days of the Old West contest. She was the 2010 PeeWee Queen. She enjoys riding horses with her Nana, 4-H at Heathers and Girl Scouts. Recently, Bailey has taken up mountain biking. And she likes playing with her goat Annie Oakley. ( Lane Southwick, 10, of Jerome is the daughter of Chester and Tasha Southwick. She likes ranching, rodeo, riding her horse Angel and spending time with her family. Her favorite color is pink, her favorite food is corn-on-the-cob, and Lane enjoys singing and dancing. Mary Ann Knight, Madeline Amend, Shelly at Sawtooth Tack and Feed, Bill and Vivian Bobbitt, Thelma and Elizabeth Cameron, Claudia at the floral department of Hailey's Atkinsons' Market, Loryhl Davis, Julie McMurphy, Karen Pierce and the gang at Jerome's Shoe and Tack Shop. The Garage Salon, Farm Bureau—Stephen Funk, Giddy-Up Coffee and Kitchen, Trinh Salon, T's & Temptations, Smoky Mountain Pizza, Branching Out, Mountain Paints, Platt Electric Supply, Integration & Control Services, Mahoney's Bar & Grill, Kristol Designs from The Simple Shop at Yellow Brick Road.